I'll say it again - I LOVE the cover! I love spreading the word about good fiction, especially by debut authors – you can take my reviews as recommendations because I don’t have time to spend on books I haven’t enjoyed. It’s fascinating taking a critical look at how and why a novel works but it can be surprisingly hard to pin down. Some authors get the various elements of the story to work together with a subtlety that’s like alchemy. 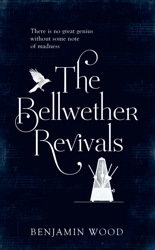 The Bellwether Revivals is that kind of book, as I somehow knew it would be. Benjamin Wood’s debut is the second of my Fiction Hot Picks for 2012 and I couldn’t wait to read it. As mentioned in my previous post Being Selective – How do you choose which books to read?, I love the title, it’s classy and gives the book a distinctive identity. I also found it intriguing and that was even before I heard what it was about. Intriguing is not the word…. The Bellwether Revivals takes a well-worn format and twists it from the word Go. Main character from humble background insinuates self into the lives of a bunch of posh people, except that this time it’s different, and it’s crucial to the story that it is. 20 year-old Oscar Lowe doesn’t aspire to the lifestyle of super-privileged Cambridge students Iris and Eden Bellwether and their entourage, he’s not even at the university. He’s an unqualified care assistant at Cedarbrook, a home for the elderly in the city, a job which belies his intellectual curiosity and his ability to read people. When he and Iris Bellwether fall in love, all he wants is to be alone with her, but she is rarely alone. She comes as part of an indivisible set. Iris’s older brother Eden is a delusional musical genius with some very dark and disturbing ideas. A brilliant organist, he is obsessed with the obscure German Baroque composer Johann Mattheson and persuades his sister and closest friends to take part in experiments to prove that the music gives him the power to heal or revive. Despite initially enlisting Oscar to help gather proof that Eden is insane, Iris’s resolve wavers and only he, with an outsider’s detachment, retains the ability to see Eden for what he really is – dangerous and out of control. The more the music came surging towards him (Oscar), the sadder he felt – because as surely as he could picture Eden as an organist at a magnificent cathedral like St Paul’s or Notre Dame, he could also picture him as a patient in some white-walled psychiatric wing, playing silent toccatas on the windowsill. Events are related through Oscar’s point of view in a third person narrative in which he acts as a bridge between the surreal world of the Bellwethers and the one in which people like him grow up on drab estates, do important but menial jobs for low pay and are destined to suffer the frailty and indignities of old age like the residents of Cedarbrook. The interaction between Oscar and the two elderly men in the story, his patient Dr Paulsen and American psychologist Herbert Crest, was beautifully conveyed, the insights into ageing and mortality terribly moving and all the more remarkable coming from someone not even 30 when he wrote the novel. At times I felt I could hear the wisdom of someone considerably older than me (and I’m considerably older than Benjamin Wood). No matter that I didn’t entirely buy it coming from the 20 year old Oscar – I wasn’t convinced that he would read Descartes either, I’d got it that he was bright (still, at least he didn’t find it easy!) The thing about Oscar that did jar with me throughout was his name, which seemed an unlikely choice by his parents as described, and I wondered why the author didn’t choose something classless like David or Matthew. Two pages in, I was worried. There was a ‘Prelude’ which reveals a great deal about the outcome of Eden’s experiments. It was an arresting and dramatic opening, but it’s a risky tactic that can easily rob a story of suspense and ruin the ending. Well, it’s a testimony to Wood’s skill as a storyteller that it doesn’t do that. He reached a perfect judgement on how much to reveal and how much to withhold, keeping my curiosity alive all the way through, desperate to fill in the sinister details. Later, there’s a moment so shocking I can’t get it out of my head. The Bellwether Revivals will make a stunning film. Wood’s stylish, sensual novel really cast a spell on me. A fictional experiment. No new post next week, it’s half term and my younger son thinks I spend too much time on the computer (he’s right). Back the week after with an article on book groups. « Being Selective – How do you choose which books to read? Thanks Jane. If you decide to read The Bellwether Revivals I’m sure you will love the way it manages to be both literary novel and gripping psychological thriller. I’ve just learned that the author has sold more titles to Simon & Schuster, which is really exciting news. Yes, next week I’m staying off the PC, except for a few Tweets. Enjoy your week too. Hi Isabel, I read The Bellwether Revivals as a result of blog and twitter mentions from you, and I’m very glad I did. While the theme of the book is not one I choose very often, Benjamin Wood’s writing is quite extraordinary and really drew me in. Like you, I was surprised that the Prelude did not temper my desire to keep reading – the book is a real page-turner, and the writing is muscular and complex while also subtle, a great accomplishment in my mind. As you also mentioned, I especially liked the portrayals of the two older characters: psychologist Herbert Crest and Professor Paulsen. They were finely wrought, very individual while also being representative of the concerns that befall people as they age. Remarkably well-done. is in this respect an ambiguous one. Yes, “the patient in a psychiatric wing playing silent toccatas on the windowsill” is beautifully imagined, even more so if you know enough about baroque music to know what a toccata is. Benjamin Wood chose exactly the right musical form. This is, however, also the weak point of the image because Oscar has not had the musical education or experience to have “toccata” as part of his active vocabulary. By choosing this specialised musical term, the author has made the mistake of putting something which has occurred to the omniscient narrator inside the mind of Oscar, who carries very different store of background knowledge. Again, this is meant to be Oscar’s perception, not the narrator’s. Why is this lorry across the motor way? How did it get in that situation? How many lanes of traffic is it blocking? Final editing should simply have removed any reference to a motorway. On page 30 a harpsichord is introduced into the story. On page 50, we come across that harpsichord again, but suddenly, on pages 52, 54, 55, 56, and for the rest of the book, this instrument is no longer called a harpsichord but a clavichord. Harpsichords and clavichords are both keyboard instruments of the baroque era and a bit later, but apart from that you cannot possible confuse the two, especially if you are even mildly interested in baroque music or a composer like Mattheson, who will have played both instruments. They are of quite different sizes and shapes and have very different tone production mechanisms, sounds and musical characteristics. (Wikipedia has a full description of each). Surely, SOMEBODY should have noticed this mix-up before this book went to print? I don’t get it at all. A lettuce is definitely much lighter than a human head (a large red or white cabbage might come a bit closer to it in terms of weight). It seems such a surreal image. Page 364: “the nib of his biro”: A biro does not have a nib but a tip. Pens have a nib. An ambulance has one siren and one blue light, and the sentence implies that there were several ambulances. Line 11 of that page, however, makes it clear that there was only one. The idea of “a wash of flashing light(s)” is puzzling. The expression “awash with” is more usual than “a wash of”, but would not be right for his situation since there was only one ambulance. The noun “wash”, however, means (apart from laundry and ablutions) a wave caused by a ship, a water colour technique or an old fashioned way of evenly colouring in technical drawings or maps (rather the opposite of colour superimposed by a flashing light). In any case, as soon as the ambulance arrived in the garden the blue flashing light had served its purpose and could, and no doubt would be turned off for it would be a distraction to the medics’ work and to the others. In the first place, “like” should be: “as if”. In the second place the simile is a very messy one. The simile reads as if Crest’s body acts a focus for daylight to become stronger when it passes though his body. But strong, focused light, like a “torchbeam”, is not focused by the dust it shines through. It does not shine though dust any more than all other light, but makes it visible. (All light “penetrates” the dust which is suspended everywhere in the air). Normal daylight is not like a torchbeam, but rather the opposite, i.e. completely diffused. If Crest’s body started to acquire the characteristic of the omnipresent suspended dust in the air, it would become increasingly transparent and eventually invisible in normal daylight. Wood aimed to express this, but rather confused the matter with the ”torchbeam”. The writing certainly improves as the book progresses. I think that once the momentum of writing increased, Benjamin Wood forgot that he was writing literary fiction, and just got on with saying it as it happened in a less self-conscious way. Although, less self-conscious writing should not mean careless writing, e.g. Wood is clearly a talented writer who can construct a great story. I blame the publisher, however, for printing this book before it was ready. I am not nit-picking for the sake of it. Any stylistic mishap trips the reader he up and he then has to pick himself up to get re-immersed in the story; this is no different from the way wrong notes spoil a musical performance. A final close reading by a critical editor would have made all the difference and would have made this book made this into a polished, excellent novel. Benjamin Wood has, I think, been let down by his publisher. It would, in principle, be very easy to revise the text for the paperback edition which will surely follow, but I don’t know enough about the publishing industry to know how viable that might be in practice. Tom, thanks for your considered comment. I think the way you and I relate to fiction is fundamentally different and I disagree with you on much of this, but differences of opinion are at the heart of many a stimulating literary debate! Two things: I don’t agree that Oscar wouldn’t know what a toccata is any more than the average listener to Classic FM wouldn’t – he’s clearly an exceptionally cultured young man considering his lack of formal education (he does, after all, read Descartes voluntarily!) and I don’t find it inconceivable that he would have heard Bach on the radio. Also, when I say a novel is well-written, it doesn’t follow that I think every sentence is sheer perfection – you have a point with some of these examples but they didn’t leap out at me at the time. I think this level of critique is highly subjective and no editor can please everyone. I can see that it interfered with your enjoyment of the narrative, and I have read novels that do that, but for me this certainly wasn’t one of them. Glad to hear that you still found it worth reading. I bet you won’t forget it in a hurry!